Dry pigments are used to create a variety of painting media such as oils, acrylics, watercolors, egg tempera, and encaustic. Dry pigments are often used in mixed media and decorative painting techniques as well. To create an artist’s oil color, pure dry pigments are thoroughly ground and mixed into refined or cold pressed linseed oil to form a stiff paste. 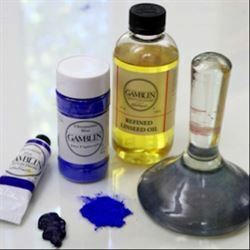 Gamblin Artists Colors offers a range of dry pigments for painters who want to make their own oil colors. Regardless of the binder used to mix dry pigments, artists should be very careful when handling powders. A respirator mask should be worn so that no pigment dust is inhaled.